I got alittle crafty before listening to MacFarlane open the Oscars last night... Its not exactly as I had planned, but I like it. I have been looking at the color challenge from Fab Fri, for almost 2 weeks... so I finally just buckled down and attacked it! Using a bunny & the sketch challenge from Friday Mashup! was alittle more difficult, since I didn't think I had any non punch bunnies in my stash... but this little guy from So Cute (retired) fits the bill! Yep, he definitely works! Very cute! Love the sentiment you chose. Thanks for joining the Friday Mashup this week. Oh, that bunny is so cute! Great job on mixing the two challenges. Thanks for joining us at Fab Friday! That little bunny is just adorable! 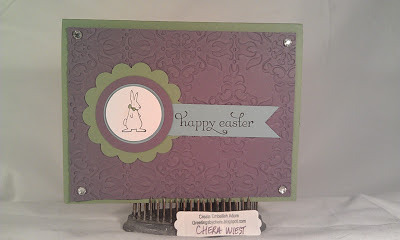 I really like how you used multiple layers of punches to make this smaller stamp stand out! Thanks for sharing with us at Fab Friday! Lovely! I really like how it come out. That embossed background looks great with that image. 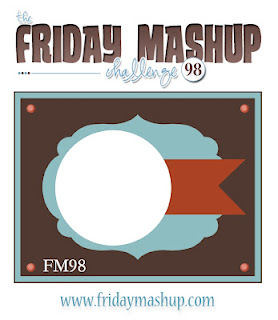 Thanks for joining us at the Friday Mashup this week! Great card! I love the embossing and the bling in the corners! This is such a sweet Easter card! I love the little bunny image and the colors are perfect for a springtime card. Thanks for playing at Fab Friday!